I never learned his name. I didn't know anything about him. How old was he, if he was married or had children, where and how he lived. I never heard his voice. We had never talked. But we were together for more than 20 years. We were seeing each other every Sunday or Wednesday sometimes, no matter how the weather and the situation was. His trumpet was like the "The Magic Flute" in the fairy tales. When he was starting, thousands of voices were becoming as one, the torches were firing and the hearts were beating faster. A distant but lonely journey started for thousands, a breakout, a denial for everything was concerning us that moment. Day by day, this music, the trumpet's march moved me more and more. As a child, later as teenager, when i was serving my duty, when i was on the road or at work, something was changing within me as i was listening this tune from the radio. Now the trumpet silenced. Our orchestra became poor. This note is a goodbye to Atilio, the musician of the stadiums, the man who put music in every cry for "GOAL". And if someone say that this is an exaggeration to write an article for Atilio, for Gate 7, for football it's better not to think of hooligans and violence, of fixed matches and bad referees. He can think of the kids, the teenagers but as well as the grown ups who love the beauty of sports, the ones who live in the bright side of the moon , who can make this lonely journey even if they are surrounded by thousands others in the same stand. 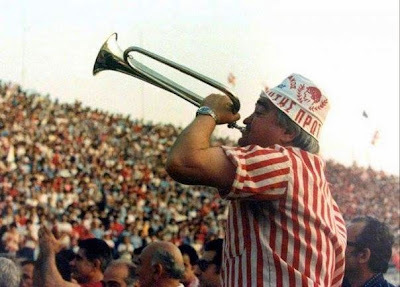 They will always hear, from somewhere far away, the sound of Atilio's trumpet. everything were stopping and the hands were rising! 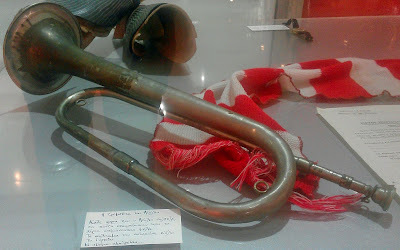 The trumpet was resounding throughout the stadium. Αναρτήθηκε από Død στις 6:08 μ.μ.